Background: Uveal melanoma is the most common primary intraocular malignancy in adults. So far, there have been no effective targeted therapeutic agents in patients with uveal melanoma. Artesunate is a semi-synthetic derivative of artemisinin extracted from traditional Chinese medicine Artemisia annua L for treatment of severe and multidrug-resistant malaria. Besides its antimalarial activity, artesunate is identified as an anti-cancer drug due to the inhibition of Wnt/β- catenin pathway in multiple types of cancer. However, the effect of artesunate on uveal melanoma remains unknown. Objective: We evaluated the anti-tumor effects of artesunate on uveal melanoma cells, and analyzed in terms of Wnt/β-catenin pathway, cell growth, cell death, cell migration, invasion and cancer stemlike cells (CSCs) properties. Methods: Primary (92.1, Mel270) and metastatic (Omm1 and Omm2.3) uveal melanoma cells were used. Immunofluorescence staining, dual luciferase reporter assay, Western blotting, MTS, soft agar cloning technique, Annexin V/PI analyses, wound healing scratch assay, in vitro transwell migration and invasion assays, aldehyde dehydrogenase (ALDH) analyses and melanosphere formation assay et al. were carried out. 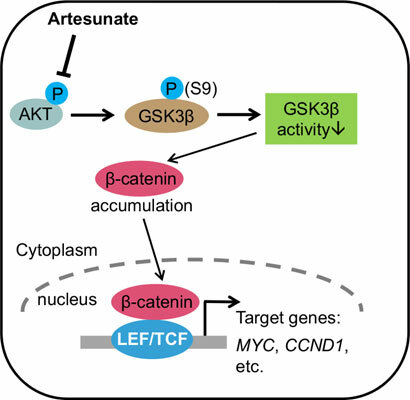 Results: Artesunate suppressed the phosphorylation of GSK3β at S9, and lowered the protein level of β-catenin and its downstream targets (c-Myc, cyclin D1). Artesunate potently inhibited cell viability and colony formation ability. Treatment with artesunate significantly induced apoptosis. In addition, artesunate significantly reduced the migration and invasion of uveal melanoma cells, impaired the traits of CSCs in vitro. Conclusion: Artesunate may be a potential interest for the therapy of uveal melanoma. Keywords: Artesunate, cancer stem-like cells, migration, invasion, uveal melanoma, Wnt/β-catenin. Keywords:Artesunate, cancer stem-like cells, migration, invasion, uveal melanoma, Wnt/β-catenin. Abstract:Background: Uveal melanoma is the most common primary intraocular malignancy in adults. So far, there have been no effective targeted therapeutic agents in patients with uveal melanoma. Artesunate is a semi-synthetic derivative of artemisinin extracted from traditional Chinese medicine Artemisia annua L for treatment of severe and multidrug-resistant malaria. Besides its antimalarial activity, artesunate is identified as an anti-cancer drug due to the inhibition of Wnt/β- catenin pathway in multiple types of cancer. However, the effect of artesunate on uveal melanoma remains unknown. Metabolic Features of Melanoma: A Gold Mine of New Therapeutic Targets?